“A Christian Community is the most important thing God has given to me in my life. Show-Me made that obvious to me.” Aaron reflects on his life before Show-Me, his life after Show-Me, and the Christians who filled significant voids in his life, directing him to become – not just a man – but a man on God’s mission. Growing up, Aaron felt like nobody really wanted him. Since his parents divorced when he was in preschool, he only saw his dad once or twice a month. “Dad would always find every excuse on why he could not be there,” stated Aaron. “Even when he was physically there, his attention was somewhere else.” His mom, tried her best, but working two to three jobs as a single parent meant she was rarely home. “I knew mom loved me, but I questioned if she cared because she was never around,” said Aaron. His older sister, Gabriella, would frequently leave to go out with friends. Alone at home, Aaron spent most of his time in watching television or playing video games. With few social skills, Aaron didn’t have many friends or know how to act around other kids. Desperate for someone to pay attention to him, Aaron began acting out whenever he was around other people. “I wanted friends– someone to say they cared – so bad that I would do anything to get them to notice me,” Aaron recounted. His antics only alienated him more as the other kids thought of him as “weird” and made fun of him. His loneliness turned to anger as he got older. Aaron would release his frustration through fits of rage: getting in fights, throwing things, damaging walls and furniture. “Anger would at least get me attention and attention meant someone being present in life,” remembered Aaron. His mom felt like she was losing control of her children. Aaron and Gabriella grew increasingly disrespectful and rebellious as lack of structure and anger spiraled out of control. Aaron’s incidents escalated from an attempt to harm himself with a knife to running away from home. After exhausting all other family and resources, she knew she was going to need some help when she faced surgery in 2005. Through a friend, Vickie found out about a place called Show-Me Christian Youth Home. “I just wanted what was best for my children,” she recalled. “I needed to allow my children to grow and get away from the peer pressure and their friends back home. With confusion and disbelief, I wondered if this was the right decision and just how others were going to see me as a parent for leaving my children at Show-Me.” Her difficult decision became a catalyst for Aaron to become the fine young man he is today. But it wasn’t an easy road. Aaron describes the first few weeks at Show-Me as “torture.” He didn’t want to be there. He didn’t want the rules, the structure, the responsibilities, or the obligations of being part of a functioning family. “I came into Show-Me with all these freedoms, and now they were taken away from me,” stated Aaron. He reasoned that he would put on a mask and put in his time, hoping to return home as soon as possible. As the days wore on, Aaron slowly started to realize the importance and purpose of family, rules, and structure. As his relationship grew with his houseparents, Bart and Sarah Hinz, he learned to open up more. Lovingly and consistently guiding him through life and responsibilities, he found comfort through their affirmation. “Bart and Sarah introduced me to family closeness…and spiritually invested in my life.” Bart showed him how a kind, caring, and consistent father was the spiritual leader of the family. Feeling like he had someone he could talk to about anything, frustrations no longer turned into uncontrollable anger. With this new outlook, his grades and attitude improved. After 18 months at Show-Me, Aaron and Gabriella returned to their mother’s home. Though Aaron and Gabriella had a different attitude, and Vickie had made significant improvements, herself, “it quickly returned to being all about me and doing anything I desired,” Aaron recalls. “I didn’t have the discipline or structure to develop the character I needed to succeed as an adult.” Those two years he felt lost, empty, without purpose and without a community to support and guide him. During his summers, he interned as a youth pastor for the Sheridan Christian Church. Jeff Blaine, former houseparent and now minister at the Church, helped him figure out that it takes discipline to allow God to take full control of your life. “He showed me how to live a life where you are shepherding people and sharing the gospel,” recalls Aaron. After graduating in 2012 from OCC, Aaron served as a youth minister and in a group home for teenage boys like himself. “Each step, God is strengthening me in my faith to be able to pour out love rather than just accept it,” said Aaron. 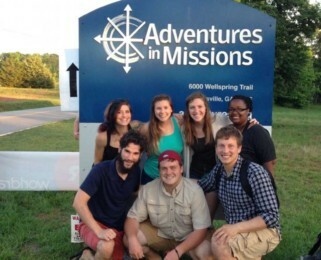 Eventually, the door opened to mission work with Adventures in Missions. After prayer and counsel with his community of Christian mentors, Aaron signed up for an eleven-month mission. 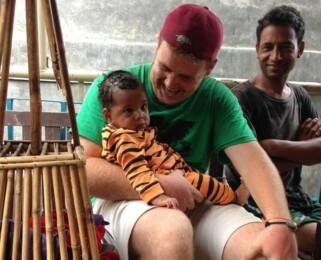 Right now, Aaron is half-way around the world ministering to orphans in India. He has a heart for the lost and hurting, a heart softened and shaped by the experiences of his own loss and hurt. He is determined to live a life not focused on himself – a life lived for his God and His people.